What I wouldn’t give to be a fly on the wall in the Supergirl writers’ room. It seems likely that the idea of Lex Luthor manipulating the whole season is at least a little bit of a retcon, but when did the writers come up with it? Had they just been dropping in random scenes of Kara’s Kaznian clone with the intention of figuring it out later? Was there a different plan that got scrapped for the Lex idea? I ask all that because while “The House Of L” is a really, really engaging episode with all the focus that last week’s outing was lacking, it can’t quite shake the feeling that it’s rewriting a lot of the season on the fly—particularly the tossed off idea that Ben Lockwood has unknowingly been a pawn in Lex’s plan all along. So it’s to the episode’s massive credit that it works as well as it does despite that inherent narrative wonkiness. “The House Of L” plays like a redo of the Lockwood-centric episode “Man Of Steel,” now that the season has decided it wants to have Lex as its central villain instead. 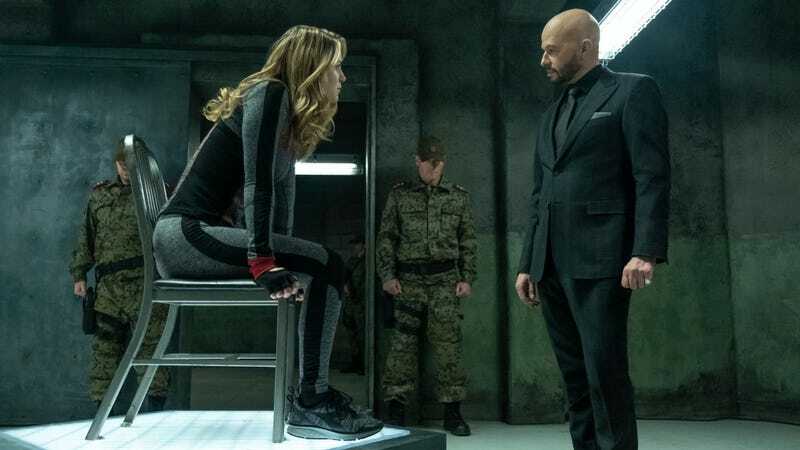 Like that episode, this one flashes back in time to fill in the gaps on what Lex has been up to—mostly just over the course of this season, although we do see his trial and sentencing three years ago. What makes “The House Of L” work is that it really invests in the complex emotional journey of not only Lex, but also Kaznian Kara too. (Snowbird? Red Daughter? Let’s go with Red Daughter). One of my concerns about Supergirl introducing Lex as a central figure is that his larger-than-life persona would overshadow Kara in her own series. And while, to be fair, “The House Of L” does sideline Kara, it thankfully doesn’t sideline Melissa Benoist. In fact, she does some series-best work in her first extended appearance as Red Daughter. Crucially, Red Daughter isn’t just “Evil Supergirl.” Like Kara, she’s smart, observant, and inherently empathetic. Even without her memories or the ability to fully control her powers, her instinct is to rush to help those in need. There’s a warm, playful side to Red Daughter, which we see in her sweet friendship with a young Kaznian boy named Mikhail. Her status as an antagonist doesn’t come down to an inherently evil nature, it’s about cultural perspective with a dash of Luthor manipulation on the side. To her credit, Red Daughter doesn’t just blindly listen to Lex. She digs into Kara’s journal for more context and even impersonates her Kryptonian “sister” to try to understand her. Though Red Daughter is too rooted in her Kaznian perspective to fully see Kara as a hero, she’s willing to see the grey area and appreciate Kara’s compassion and friendships. At least until Lex launches an attack on Mikhail and stages it to look like an assault by the U.S. Navy. I’m not sure I buy that Mikhail’s death (well, presumed death, it turns out Otis secretly saved the kid) would be enough to fully flip Red Daughter into full-on Supergirl hatred. But that’s for future episodes to flesh out. Right now, I can’t stop thinking about Melissa Benoist’s ability to make Red Daughter’s emotional breakdown feel entirely distinct from a Kara breakdown. What a performance. This is also a great episode for Jon Cryer, who gets more room than he did last week to settle into his fully villainous version of Lex. “The House Of L” leans hard into enjoyably over-the-top comic book storytelling with Lex, from his poisoning of a whole courtroom to his peppy realization that the only way to get Lena’s help curing Red Daughter is to give himself cancer. Yet the episode balances out Lex’s inherent goofiness with some emotional heft as well. Lex genuinely seems to believe that Red Daughter is a miracle gift meant just for him, to the point where he’s more than happy to play Philip II of Macedon to her Alexander the Great—someone who paves a path for her to finish. The meatiest thematic material in “The House Of L” is about siblinghood. When Red Daughter first walks into the Kaznian military base, the only word she knows is “Alex.” Even without any of Kara’s memories, Red Daughter’s somehow maintained a connection to the most important person in Kara’s life. Unfortunately, Lex is able to use his coincidentally similar sounding name (in what feels like a much better riff on the infamous “Martha” moment in Batman v. Superman) to convince Red Daughter he’s the best friend she’s been trying to reach. For his part, Lex attempts to use his partnership with Red Daughter to fill the Lena-shaped hole in his heart while also getting revenge on his sister for testifying against him in court. And he’s able to convince Red Daughter that, like Lena, Kara is a selfish sibling who’s trying to usurp her rightful place. When Kara butted heads with the controlling nature of the DEO, she ultimately chose her freedom, independence, and privacy above all else. Red Daughter makes the opposite decision with Lex, agreeing to bow to his authority in order to honor her core values of discipline and stoicism. That makes for a fascinating juxtaposition between two very different, yet also very similar Kryptonian “sisters.” Coupled with some incredibly stylish direction from first-time Supergirl director Carl Seaton, “The House Of L” emerges as one of the strongest episodes of the season—even if it maybe wasn’t in the cards from the start. This episode is jam-packed with references to Superman and Supergirl lore, including Lex and Kara’s battle atop the Daily Planet building. Also, when Red Daughter poses as a brunette waitress she uses the name Linda Lee—which is Kara Zor-El’s original comic book alter ego. Next week’s episode is called “All About Eve.” Is there any chance Eve is actually a double agent and was just posing as a Lex Luthor “Manson girl” while secretly working for Lena this whole time? I loved the Russian opening credits/Red Daughter end logo. Otis mentions that he came back from the dead, but doesn’t actually explain how that happened. I was shocked and delighted by Supergirl’s commitment to figuring out a way to give Red Daughter earrings so that she could impersonate Kara. Talk about retconning that random Kryptonite atmosphere poisoning for something useful! The utility of Red Daughter’s uniform/costume really makes Kara’s look silly by comparison. Another gem from Melissa Benoist’s Instagram. Is there anything she can’t do?